LACMA’s current headlining exhibition, “Bodies and Shadows: Caravaggio and His Legacy,” installed in the Resnick Pavilion at the Los Angeles County Museum of Art, was a must see for me while home on winter break. While the Resnick Pavilion is not among my favorite art venues due to the sheer enormity of the main gallery, the placement of this exhibit in one of the more traditional side sections created a thoroughly enjoyable experience. The narrowness of the gallery, with its twists and turns and generous alcoves, is a wonderfully suitable place to display Old Master paintings. The yellow paint applied to the walls, as well as the carefully controlled lighting, immediately put me as a viewer both at ease and in the right mood for the dramatic mastery of Caravaggio’s work. 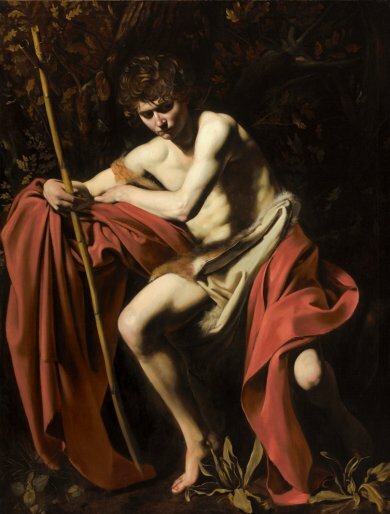 This exhibits seeks to familiarize the viewer with the particular style of Caravaggio to better understand his lasting influence on painting all throughout Europe. Caravaggio is known primarily for his approach to color and shadow in his works; they all display a strong sense of chiaroscuro, or the contrast between light and dark. Caravaggio’s work is also characterized by a strong sense of gritty realism and naturalism of his figures; the fruit in his paintings is ripe and often rotting; his saints and religious figures are ordinary, ill-formed people from any 17th century Italian street. They are wrinkled, their faces asymmetrical, dirt under their fingernails—refreshingly, gloriously real humans in the guise of saints and holy beings. One of the greater Caravaggio works on display is the artist’s late “Denial of Saint Peter,” which the accompanying blurb compares, quite aptly, to Rembrandt, with its liquid, precise use of lighting on the various textures of armor, cloth, and flesh. The figures are ordinary; the background lighting is dramatic yet realistic. Caravaggio’s use of chiaroscuro in this work demonstrates his visual understanding of and confidence with painting the properties of light and shadow. As a result, the work creates a visually lasting impression. The exhibit contains a brief survey of Caravaggio’s oeuvre, presenting the works chronologically to highlight his evolving approach to handling paint. Much of the show is devoted to the artist’s legacy. Caravaggio had no pupils or students, but many admirers and even rivals. The exhibit presents some of Caravaggio’s Italian contemporaries who emulated his style, such as Orazio Gentileschi, often placed next to the master’s own works to invite comparison and contrast (all of which serves to elevate the particular skill of Caravaggio at the expense of his imitators and contemporaries). However, the omission of Artemisia Gentileschi, Orazio’s better-known daughter who also painted in the Caravaggesque style, from the exhibit was glaring. The exhibit then leads the viewer through France, Spain, Italy, and the Netherlands, highlighting the rivals and stylistic imitators of the great master. What Caravaggio had introduced to art had never been done before, and his style quickly became popular in all the aforementioned countries. In this vein, the exhibit divides his influence largely by country, using the wide alcoves provided in the space to create small groups of regional artists. In this way the show demonstrates the pervasive reach and influence of Caravaggio’s style. Excellent works by Simon Vouet, Georges de la Tour, Diego Velazquez, Francisco de Zubaràn, and Gerrit von Honthorst all highlight how artists from various countries adopted the dramatic lighting and sense of realism. Walking through the exhibit, I noted how Valentin de Boulogne’s “Musical Party” bore a striking stylistic resemblance to works I had seen elsewhere by the Dutch Franz Hals. Orazio Riminaldi’s “Daedalus and Icarus” has a sensuality about the figure of Icarus reminiscent of Caravaggio’s treatment of young men. It is critical to note, however, that even the finest of these Caravaggisti (followers of Caravaggio’s style) lack Caravaggio’s sense of grit. Their works are images with outstanding importance; however, in comparison to the master, their realism is a polished, studied one. An unfortunate consequence of the popularity of Caravaggio’s innovative style is that as the prominent artists from the major artistic centers of Europe begin to adopt said style, all the works began to blend together stylistically. It becomes near impossible to differentiate between a Dutch work and a contemporary Italian work in the same style. The repetitive motifs of fruit in baskets, of dissolute, ordinary-looking people in dramatic lighting create a sense of homogeneity that is inescapable. The exhibit serves to highlight this growing stylistic convergence. After all this Baroque drama, what a breath of fresh air the light and pastel-prettiness of the Rococo style must have been. I emphatically recommend getting the audio guide to this show to accompany the visual spectacle. The guide has features on many of the major works on display. The most valuable contribution in the guide is the beginning of a discussion challenging the traditional artist-mythos surrounding Caravaggio. General wisdom around the master suggests that, based on the dark and tortured quality of his works, Caravaggio the man must have also had a rather dark and tortured internal state. It is an interesting point to bring up because it contradicts how the great artists are commonly seen. The guide compares Hitchcock to Caravaggio in that they both created powerfully violent, dark works of art; Hitchcock claimed that they were an intellectual exercise, not some reveal of a pained, twisted soul. How, then, should we think of the artist as a human being? Must we rethink how we use an artist’s oeuvre in our understanding of the artist? I highly recommend this exhibit to my Los Angeles-area followers and readers. I also recommend staying at the museum to check out some of the other exhibits and the strong permanent collection. The show runs until February 10, 2013. Great review. You have done a good job of explaining the importance of Caravaggio as an artist and an innovator. I especially like the question you raise about artists as social commentators vs artists as emotional exhibitionists. Nice job! I love Caravaggio's use of normal-looking people, as you mentioned. One can only take so many Botticellian faces, am I right? Didn't know about the Artemisia Gentileschi connection, but now that you mention it, I see the resemblance. Holler for Artemisia! Judith Beheading Holofernes is one of my favorites.